Drones are capable of flying up close to the tallest skyscrapers in the world and film them in ways that are unreachable by other cameras. AirVuz put together an aerial compilation of the best drone videos of these massive structures, including supertall and megatall buildings. The Exchange 106 is under construction in the financial district of Kuala Lumpur, Malaysia, but will stand 452 meters when it’s complete in 2019. Another giant skyscraper in Asia is Landmark 81 in Ho Chi Minh City, Vietnam (461.2 meters). The Lakhta Center (462 meters) in St. Petersburg is not only the tallest building in Russia, but it’s also the tallest building in Europe. Asia has the tallest skyscrapers in the world and both camera drone pilots and FPV drone pilots are capturing breathtaking footage of these buildings. An FPV pilot flew by the International Commerce Centre (484 meters) in Hong Kong, China. In Taipei, Taiwan the Taipei 101 stands 508 meters high. All the major cities in China have impressive skylines lined with giant skyscrapers including: Tianjin CTF Finance Centre (530 meters), Guangzhou CTF Finance Centre (530 meters), Goldin Finance 117 (597 meters), Ping An Finance Centre (599 meters) in Shenzhen, the Shanghai World Financial Center (492 meters) and the Shanghai Tower (632 meters). The tallest building in the United States of America is One World Trade Center (541.3 meter) in New York City, New York. It’s also one of the top ten tallest buildings in the world. In Seoul, South Korea you can see drone footage of the Lotte World Tower which is an impressive 554.5 meters high. And finally we have a drone video of the tallest building in the world, the Burj Khalifa (828 meters) in Dubai, UAE. 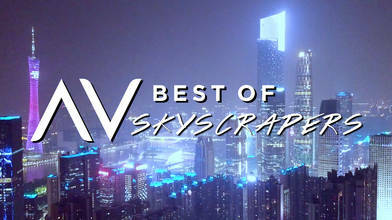 To view our entire curated collection of Drone Videos of the World’s Skyscrapers click here.